We’re always happy to sell some of our sourdough starter so you can begin creating your own baked goods at home. 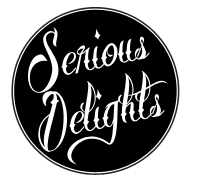 Send us an email at info@seriousdelights.com.cpr5.ezhostingserver.com first to let us know you’re coming in, and we’ll get some starter ready for you in a few days. 1. Keep it in the fridge unless rebuilding. 2. Rebuild once a week. You can skip one week only, if you give it a good stir. 3. You can always discard excess starter after rebuilding — don’t feel bad, it’s just a little bit of flour. In general, the best way to tell what your starter needs is by looking at it — with experience, you will soon be able to tell if needs to be fed or not, assuming you follow the feeding instructions below. A healthy, young and active starter will be thick and almost difficult to stir with a spoon — the condition it was when we sold it to you. That exact same starter, if left in the fridge for a week, will begin to thin out until it is the consistency of a melted milkshake. After that, it will begin to form a layer of grey water on the top surface — these are dead yeast cells and can be discarded; the starter below can still be used, but not to bake with, only to rebuild. Remember… It’s Alive! Like any living organism, your starter is affected by temperature. Temperature is how you communicate with the yeast what you expect from them. From 35º to 50º tells them to go to sleep — below 32º tells them to try and hibernate; unfortunately yeast is not very good at this and most of them will not survive. Between 75º and 90º is their happy place; this temperature tells them to work hard on converting carbohydrates into simple sugars and carbon dioxide. Above 110º becomes stressful to them; above 140º will kill them. This is important when making bread or pizza dough. Typically the easiest ingredient to control temperature is water. However, it takes some trial and error to determine what water temperature will yield what dough temperature. It depends on your mixing procedure and also the room temperature. In general with home baking, you will want to aim for a 72º final dough temperature, unless you are refrigerating the dough overnight for an extended fermentation, in which case you’d aim for 62º to 66º. The most important thing here is always feed equal parts of weighed flour and water — don’t just eyeball those because it will take away the “consistency test” of judging the condition of the starter. 1. Determine how much starter you will need to bake with (Remember you will want some “seed” left over). 2. Divide that amount by 1/4. That is how much seed you will need to start with. Multiply this amount by 4. This is the amount of water you will add to the seed. 4. Remove the starter from the refrigerator. Mix the cold starter into room temperature, filtered water until dissolved. 5. Add the same amount of flour as water, see step 3. Any unbleached white or whole wheat flour will work. (Rye and other grains will not work with this exact procedure – they absorb too much water). Mix the flour in by hand or with an electric mixer until completely smooth. On a KitchenAid type mixer, this will take less than five minutes. Always mix on LOW speed to avoid beating excessive air into the starter. 6. Leave the new starter out to ferment overnight, about 16 to 20 hours at 70º is sufficient. After that, return it to the refrigerator. Label it with the date it was fed. 7. The excess (old) starter can be used to bake with, assuming it is just one week old. If it is older, it should be discarded only because the yeast population will be depleted — old starter is not dangerous, although very old starter will eventually mold on the exposed surfaces, like cheese. Starter that old is basically dead and you will want a new culture. 8. The new rebuilt starter is ready to use after fermenting overnight, if desired, or it may be used at any point during the week, directly from the refrigerator. As you can tell, I highly suggest a digital food thermometer for making dough. They are available on Amazon for less than ten dollars and will greatly improve your chance of achieving consistent results. A mixer is less important — I use a KitchenAid at home to incorporate the dough (about twelve minutes on first speed only) and then perform a series of “folds” as the dough ferments, usually overnight. “Folds” simply means stretching and folding the dough back onto itself. Usually a “fold” is actually made up of about four indivdual folds — think of folding a piece of paper from the corners until all four corners meet in the middle; that would be one “fold”. No mixer will truly develop a dough in the best way — it must be folded. We have a $20,000 spiral arm bread mixer, and it still does not mix the dough perfectly — it must be folded. Baking is a science and an art, and the information can go on forever. We’ll stop here for now, but… If you have any questions, don’t hesitate to email back anytime!